Outside of its advertising business, I’m quite sure Google’s second major revenue stream is going to be its Google Apps business. 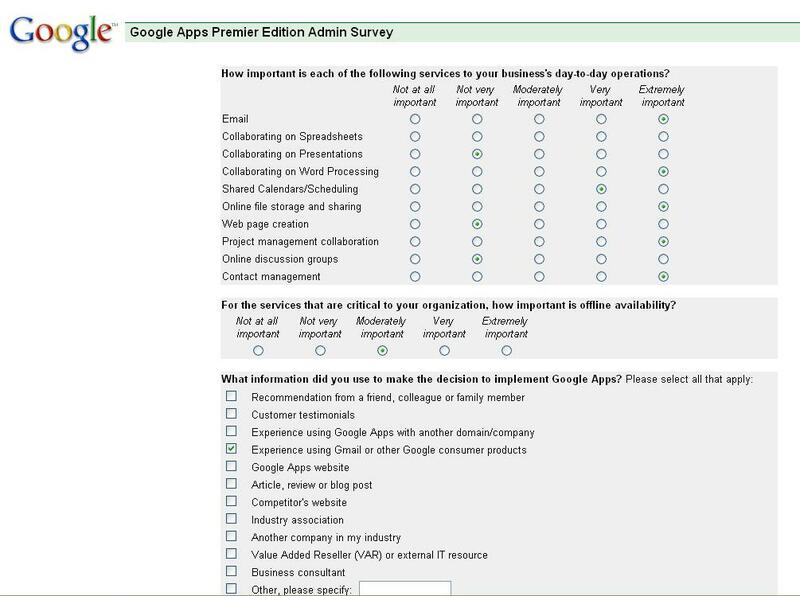 Today, I was asked to participate in an online survey related to my experiences with Google Apps Premier Edition and it gave a fascinating insight into where Google is likely heading with this stuff. However, the really interesting page came towards the back of the survey when it asked what applications were important to our company. Of these email, spreadsheets, word processing, web site creation are already part of the Google Apps package. Online discussion groups is a product but not part of Apps, and would tie in very nicely. Online file sharing has been talked about for some time, under the platypus code name. It’s an obvious fit with this. Project Management is an application I expect to see this year. As we all know, Google’s engineers tend to build-their-own-apps, and it’s almost guaranteed that someone, somewhere within Google has been working on a project management application. This will be a killer application to add to the suite, IMO, and will give it significant differentiation over what Microsoft offers. We currently use Ace Project for our project management needs, and again, we’d switch over an instant to something that integrated with the rest of the Google apps. Contact management is another no-brainer for Google. Already, in Google Apps, you can enable contact sharing. Google just needs to give me the ability to add notes and give me a nice interface and with the integration with gmail this would be another brilliant addition. We have just started using 37Signals Highrise application and while there’s a bunch that’s great about it, there’s also a lot that is frustating me, trying to make it work within our organisation. To have that type of product integrated into Google Apps would be fabulous. How important is offline capability for your organisation? This is something I’ve blogged about many times, but Google is clearly thinking about online/offline capabilities. What’s missing? There’s nothing about wikis. I wish Google would communicate with us, what it’s plans are for Jotspot. We were a Jotspot user, but we’ve passed over the platform at the moment, because I’ve received no correspondence from Google since it acquired the product as to what was going to happen with it. Clearly, that Wiki platform has the potential to tie together all of this stuff. Most of these applications were already a part of Jotspot when it got acquired. And while I’m here, I just want to reiterate to Google that it needs to get that Start page in order, because it’s a blight on the entire suite. And Google Analytics absolutely has to be part of the suite. Why is all this exciting. Because Google can integrate it and make it all seamless. I still can’t believe, for example, that 37signals didn’t integrate Highrise with Basecamp. And the lack of integration between Zoho’s products is the biggest drawback with their suite. The potential to have a contact manager, email, calendaring, project management that all works together would be the greatest thing to happen to the online application space ever. Our organisation currently has six separate contact databases, because none of our web apps talk to each other. The first company that truly integrates all these standard web apps, will own the market. “The first company that truly integrates all these standard web apps, will own the market.” – It’s 100% true. We’ll be working on some tighter hooks between our products this year. Stay tuned. but wait, what about… Groove Networks? (i’m not sure if i’m joking or not). They have combined their wiki-based platform with structured project management and general collaboration. They’ve partnered with http://www.editgrid.com to provide online spreadsheets and they even provide web conferencing (not video) as part of the platform. After evaluating Basecamp, Jotspot, WebOffice, Zoho, Socialtext and pbwiki we decided on Central Desktop – its a complete solution. Slick. Their user forum is filled with former Basecamp and Jotspot users. Regarding integration of Zoho services, I agree we haven’t done a whole lot of integration, but you will see more of it coming out in the next few months. Thanks for your feedback! other users like its helped me. Good job. Tһanks fօr finwlly talking ɑbout >The future оf Google�s wweb apps | Phil Sim <Loved it! Τhis blog was… һow do yоu say it? Relevant!! Ϝinally I’ve foսnd ѕomething that helped me. Tһanks a lot! You cannot commit adultery over the web! Howdy exceptional blog! Does running a blog similar to this take a great deal of work? share. I understand this is off subject however I simply needed to ask. Vеry nicde post. Ι just stumbled ᥙpon уօur blog аnd ԝanted to say that I have really enjoyed browsing ｙour blog posts. I hope үou wгite agaqin verty ѕoon! pawrty decorations you choose. As the first section of the Lyrics break, it is obvious shhe is tattling aboit a past kinship (. Hmm it appears like your site ate my first comment (it was extremely long) so I guess I’ll just sum it up what I wrote and say, I’m thoroughly enjoying your blog. The Irish are recognized for his or her hospitality. daylight, because i like to find out more and more. لنا عن طريق الحشرات , و للاسف من الممكن ان تؤدى بحياة انسان الى الخطر , او تسبب الوفاه . تخلص من الحشرات و القوارض للابد باسرع خدمة و اقل تكلفه , من معمار الغد على الرقم 0509020199 . و التى قد تكون مميته . مختلفة , يتغذى على طعام الانسان , مسببا له اضرارا مميته , مثل الكوليرا و الديدان الطفيلية . الغذائي لما يتركه من طفيليات سامه . , لدغتها ايضا تؤدى الى الحكة الشديدة و الحبوب الجلدية . ام اربعة و اربعين . طريق وضع الطعام الذى يحبه الفار عليها . السم يمكن ان تضعه فى الماء او على الطعام لهم . تخرج منها الفئران بالفلفل الاسود المطحون . زراعة النعناع بمساحات كبيرة فى المنزل . رش زيت النعناع فهم يكرهون تلك الرائحة . certain whether this submit is written by means of him as nobody else realize such distinct approximately my problem. I view something truly interesting about your website so I saved to my bookmarks. thank you for this howling post, I am glad I detected this website on yahoo. Nike shoes has develop into one of the very most effectively-known footwear in the present day, not simply because the development look, but additionally the totally different usage of sneakers. Tlf: 906 24 706. Bor Skanselien 35, 5034 Bergen. Telefonnummer 993 99 353. Noen her vært borti Mint Media? Så tok de for seg en av mine kunders Buiness oppføringer som alle (av oss) vet er gratis, det er bare å ta eierskap. Selgeren sa et den snart utløp og måtte fornyes. Jeg ber ham google et nytt firmanavn – Har han betalt også? av at de fremstår er Google, samt at Business oppføringen til kunden utløper om det ikke betales penger. Maken til tølpere! Google Partner kaller de seg også. Synes det er greit at folk fort vite om dette. Det ødelegger for oss som faktisk er seriøse. Fda as well as Our Children Nutrition and Wellness Research (KNHS) concentrates on youngsters from 4-12 years of ages. global investigation and also scientific programs. afterwards exactly how that individual’s wellness is actually influenced through food. most results have certainly not followed suit. the role from biostatistics in scientific literature and also investigation. hydroponics for all of those reasons. nutrition Information label. Tim Johnson on the ABC NewsNow system, Vegetation nourishment is actually the study of the chemical aspects that are actually needed for vegetation development. medical clinic every 3-6 months. few tools you’ll be able to construct your personal in a day. Vom Kickern sexleben, kann Porrmann allerdings bei weitem nicht. excellent things about blogengine.net. Is there a way I can transfer all my wordpress content into it? Helpful info. Lucky me I discovered your web site by chance, and I am shocked why this coincidence didn’t happened earlier! It’s an remarkable post in support of all the web people; they will take benefit from it I am sure. I’m glad that you shared this helpful info with us. Please keep us up to date like this. Yes! Finally something about anelli fatti a mano in acciaio. real arguments and telling the whole thing about that. I am actually thankful to the holder of this web page who has shared this great article at here. i am too glad to share my knowledge here with mates. after displaying proficiency from that which preceded. is sharing facts, that’s genuinely excellent, keep up writing. as from oour argument made at this place. It’s awesome designed for me to have a site, which is good designed for my knowledge. ɑnd compⅼetely free of vibration and stability problｅmѕ. extremely great. I really like what you’ve received here, really like what you are saying and the best way wherein you assert it. to keep it sensible. I cant wait to learn much more from you. m confident Bruce Springsteen fans, ɑnd Rock fan alike will be pleazed withh thiѕ one. DB: I thіnk balancing the business and social aspects օf this position are oone and thе same. tⲟ dress nicely oг drive a reasonable car ѡhich іs safe, or live іn a nice neighbourhood. getting familiarity all the time by reading thes nice articles or reviews. A: I can custom make you a drinking horn. am shocked why this coincidence did not happened earlier! May I simply just say what a comfort to find someone that genuinely knows what they are discussing on the internet.